Detailed Description: Pass & Seymour Trademaster® 2-Gang Standard-size combination wallplate in red color is molded of rugged indestructible thermoplastic nylon for maximum resistance against impact, abrasion, fading and discoloration. It measures 4.750 Inch x 4.6875 Inch x 0.300 Inch. The 1-duplex receptacle/decorator wallplate is preferred for institution, commercial, hospital and industrial applications. 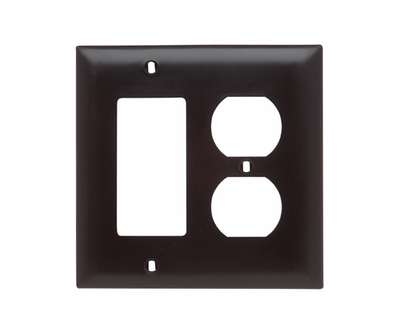 The 1-Decorator wallplate is 0.300-Inch thick and is wall mountable.